I am so excited that it’s #ProgressiveEats time again! Hooray for Barb of Creative Culinary for dreaming up this wonderful group and for inviting me to be a part of it! Last month’s theme, chosen by the fantastic Lana of Never Enough Thyme, Summer in the South Extravaganza was truly spectacular. This month, Liz from That Skinny Chick Can Bake chose the theme Summer Barbecue, and it will be every bit as delicious as last month’s! With everything from shrimp as an appetizer to two glorious desserts and everything from salad to bread to spritzers in between this will be one barbecue you will be so glad you attended! I promise to bring desserts to some of the Progressive Eats parties, but I wanted to use this monthly dinner to stretch myself and get out of the dessert box just a bit. We did not go out to eat very much when we were kids. And I don’t think I had Greek food until I was in college. But I was familiar with the “Greek Salad” that was available even at restaurants that weren’t Greek. Tons of lettuce with a few chunks of tomato, some red onion and some cucumber. Maybe 2 olives and some “Greek dressing” containing dried garlic and dehydrated onion and some mustard thrown in for good measure. I was not so much a fan, honestly. And then I read somewhere many years ago that real, traditional, authentic Greek Salad didn’t even contain any lettuce at all. And that’s when I became Intrigued. I mean, who ever heard of a salad without lettuce? Except for tuna salad. And egg salad. Oh, and pasta and potato salad. In my defense, in my world “salad” without any sort of modifier meant some sort of lettuce or other greens would play a role. And then the cheeky Greek folks didn’t even invite lettuce to the party at all! This was a revelation. 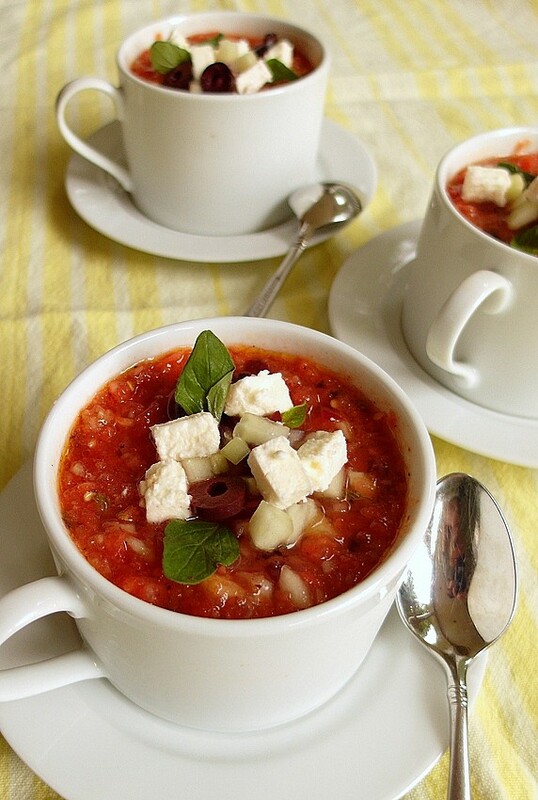 Traditional Greek salad is called horiataki, which pretty much means a vibrant and gorgeous village or peasant salad made with super-fresh and local ingredients. 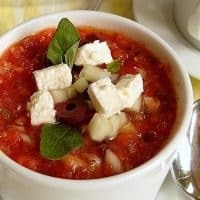 The main components are tomatoes, cucumbers and red onions, some kalamata olives and a big huge chunk of feta cheese (I would assume given the name “horiataki” that it would be the feta made in that particular village) all dressed with good olive oil and oregano. Some folks say it should contain red wine vinegar. Others say no. Some folks add capers. Others don’t. As with any other hyper-local dish, variations among different localities is common. My Grilled Vegetable Gazpacho is an homage to the horiataki salata. 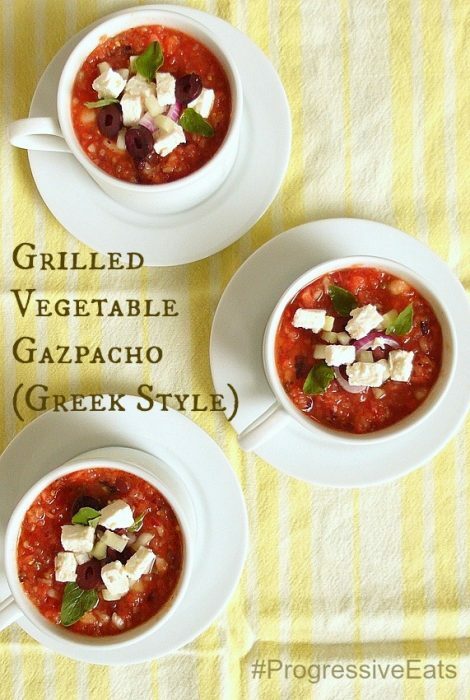 If you are a fan of Greek salads, I think you will appreciate this light and delicious Greek-Style grilled vegetable gazpacho! This recipe as written makes about 30 ounces of soup, or just shy of one quart. Scale as necessary. Brush the tomatoes and onion slices with a thin coating of olive oil. Grill over hot coals until you have nice grill marks on the onions. 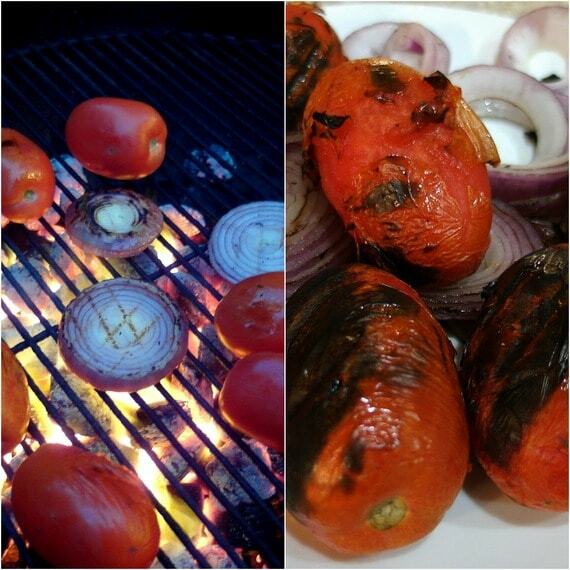 Turn the tomatoes frequently to get them fairly evenly charred. Flip the onions to get grill marks on both sides. Remove from the heat and cool to room temperature. Either proceed with the recipe or refrigerate until cold. Peel off the tomato skins and compost or discard. They should peel very easily with just your fingers. Trim out any tough core from the tomatoes. In the bowl of a food processor, pulse the olives a couple of times until they are roughly chopped. Add the onions and pulse again until chopped. 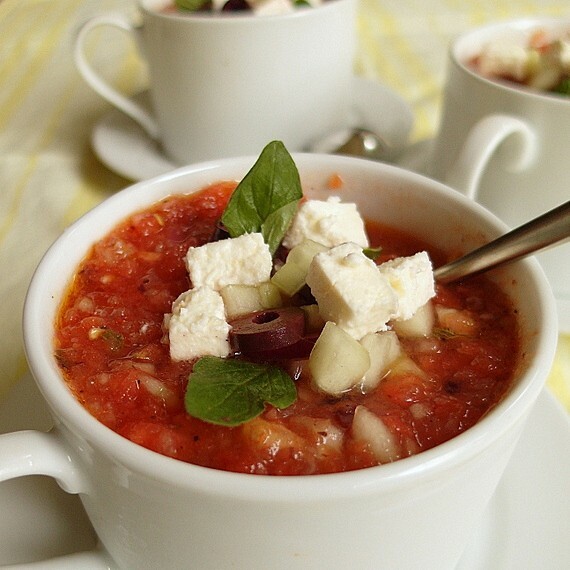 Do the same with the tomatoes and then finish with the cucumber. 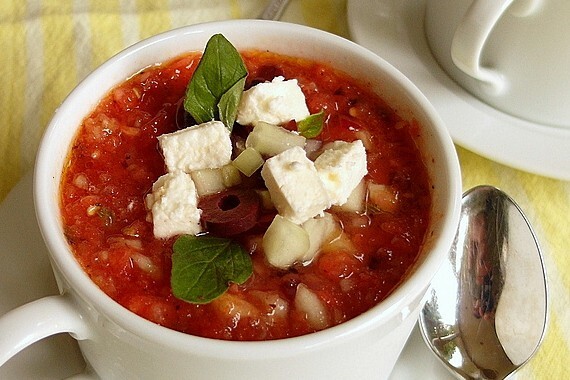 If you want a smooth soup, go ahead and process until pureed. Pour the processed vegetables into a bowl. Stir in the red wine vinegar, olive oil, dried oregano, salt and pepper. Cover and refrigerate for one to four hours so the flavors can marry. 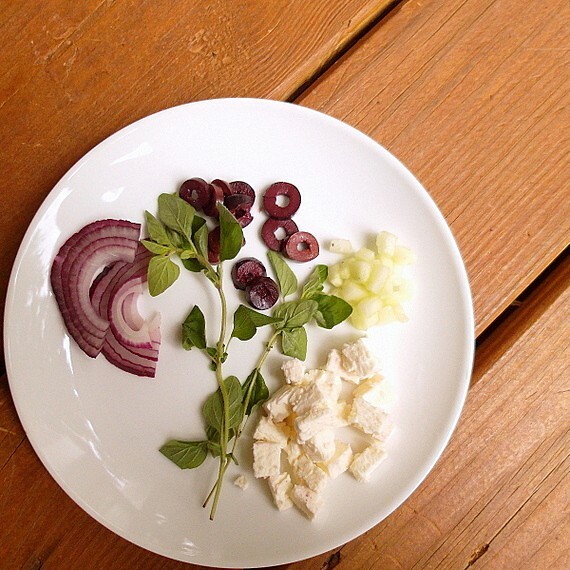 Serve in a large bowl with the garnishes all on top for presentation and then stir in to serve. If serving in individual portions. garnish each portion separately to serve. Many versions of hariataki include green bell pepper. Feel free to add some either in the soup itself or as garnish. Ditto with capers. Thank you so much for reading, and don’t forget to stop by all the other participating blogs to enjoy a virtual feast. Just look at this line up! Does it get any better than this? I think not! This month’s theme is Summer Barbecue hosted by Liz of That Skinny Chick Can Bake. You’ll love all the summertime recipes that will be perfect for your next cookout or Labor Day gathering. I am a fan of Greek salads. I’m sure I’d love this soup. What a great addition to our dinner. Thanks, Barbara! I’m in love with this group! Hooray, #ProgressiveEats! Thanks so much–I am loving the groups I’m in. 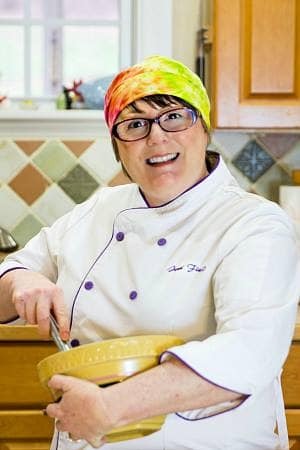 Progressive Eats is so much fun!